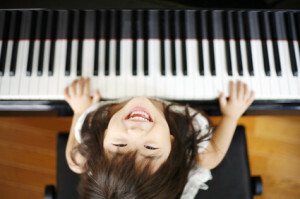 As a parent, you want to make sure your beginning piano student has a good experience while learning to play, but you’re probably not ready to go out and buy a baby grand. That’s fine. To help you decide what will be best for your child and your budget, let’s talk about the options. A quality acoustic instrument that produces sound from real strings and real wood offers a level of responsiveness and a range of dynamics and tone color than even the nicest electronic keyboard cannot match. The sooner a student has the opportunity to practice on an acoustic instrument with that kind of nuanced musical responsiveness, the better. True, acoustic pianos are expensive. The typical price range for a quality acoustic upright (also called “vertical”) piano is $4000 to $8000, and if you want a grand or baby grand piano, expect to pay even more. Hoffman Academy considers the Yamaha U1 a favorite, but there are other good brands such as Kawai, Boston, and Schimmel. If you already have a piano, be sure it is in tune and that the keys are in good working order. If you’re not ready to spend a few thousand dollars on an instrument, your beginning student can get a great start with an electronic keyboard or “digital piano”. Electronic keyboards come in many sizes and prices. 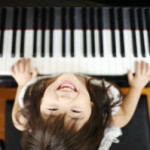 For a new piano student, the most important factors will be the number of keys and whether or not the keys are weighted. Learning on a keyboard with 88 weighted keys gives a student a big advantage. The weighted keys build hand strength and respond more like the keys of an acoustic piano, making it easier for an advancing student to move on. Our top pick for beginning students in the electronic keyboard category is the Casio Privia PX-150 , which has great key action and the same size keyboard, 88 keys, as an acoustic piano. These and other similar keyboards cost around $700. If a keyboard with 88 weighted keys is still out of your price range, we recommend that students use a keyboard with at least 61 keys in order to be able to do all the exercises in our lessons. Good quality, basic keyboards with 61 keys, such as the Yamaha PSR and the Casio CTK , will cost between $100 – $200. Whether you buy a keyboard with weighted keys or not, it’s best to go with a trusted brand such as Casio, Yamaha, Kawai, or Roland. When buying an electronic keyboard make sure to also purchase a bench and a stand . A keyboard set on a table will probably not be at the correct height for a young student seated in a chair. Ideally, the keyboard and bench should be set at the right height so that the player’s arm from wrist to elbow is parallel to the floor. There are certain advantages to having an electronic keyboard over an acoustic piano, such as the ability to plug in headphones so that a child can practice without disturbing anyone. Electronic keyboards can also be connected to a computer with a midi cable and used with all kinds of educational and music production software. They’re more portable, and, unlike acoustic pianos, electronic keyboards never need to be tuned. If a beginning student has access to a quality acoustic piano, they will have the opportunity to develop more nuanced musicianship from the first. But students can also get a great start with at an electronic keyboard and move on to an acoustic piano at a later time.